David Foster Wallace's extraordinary writing on tennis, collected for the first time in an exclusive digital-original edition. A 'long-time rabid fan of tennis,' and a regionally ranked tennis player in his youth, David Foster Wallace wrote about the game like no one else. 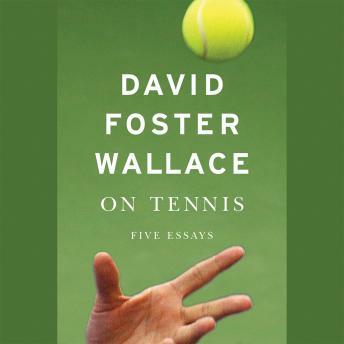 ON TENNIS presents David Foster Wallace's five essays on the sport, published between 1990 and 2006, and hailed as some of the greatest and most innovative sports writing of our time. This lively and entertaining collection begins with Wallace's own experience as a prodigious tennis player ('Derivative Sport in Tornado Alley'). He also challenges the sports memoir genre ('How Tracy Austen Broke My Heart'), takes us to the US Open ('Democracy and Commerce at the U.S. Open'), and profiles of two of the world's greatest tennis players ('Tennis Player Michael Joyce's Professional Artistry as a Paradigm of Certain Stuff About Choice, Freedom, Limitation, Joy, Grotesquerie, and Human Completeness' and 'Federer Both Flesh and Not'). With infectious enthusiasm and enormous heart, Wallace's writing shows us the beauty, complexity, and brilliance of the game he loved best.